It's that time of year again. Summer Restaurant Week is coming up in about a month and a half and those of you with American Express cards can make advanced reservations. Restaurant week is actually two weeks and runs from August 10-15 and August 17-22. Lunch is $20.08 for a 3 courses and dinner is #33.08 for 3 courses. Cardmembers enjoy an exclusive early reservation period 6/30–7/18. And their meals can help support hunger relief, too. For each transaction made on any American Express Card at a participating restaurant during Restaurant Week, American Express will donate $.25 to Project Bread's Food for Kids Fund, up to $10,000. To make your reservation: call the restaurant, tell them you're an Amex cardmember, and make you early reservation. Click (here) to access the official restaurant week website. Click (here) to go to the Amex website that mentions the early reservation promotion. 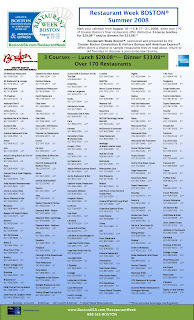 0 Response to "Summer Restaurant Week 2008 - Early Reservation"